As we left the city behind, the wilderness began to spread its magic. Shades of lavender, rose and tangerine filled the clear evening sky. Whispers of the wind caressed our cheeks and the ground was saturated with mountain water from the reminiscences of winter. The fjords subsided and what seemed like hundreds of flat, tiny islands filled the the skyline in silhouette. Desolate white sand beaches were around every corner, sporadic evening bbq's were sprinkled throughout the drive. Wild moose hid in the tall grass and eagles soared in the sky. We were visitors and it was as simple as that. The road led to a one way bridge in the direction of the sun. 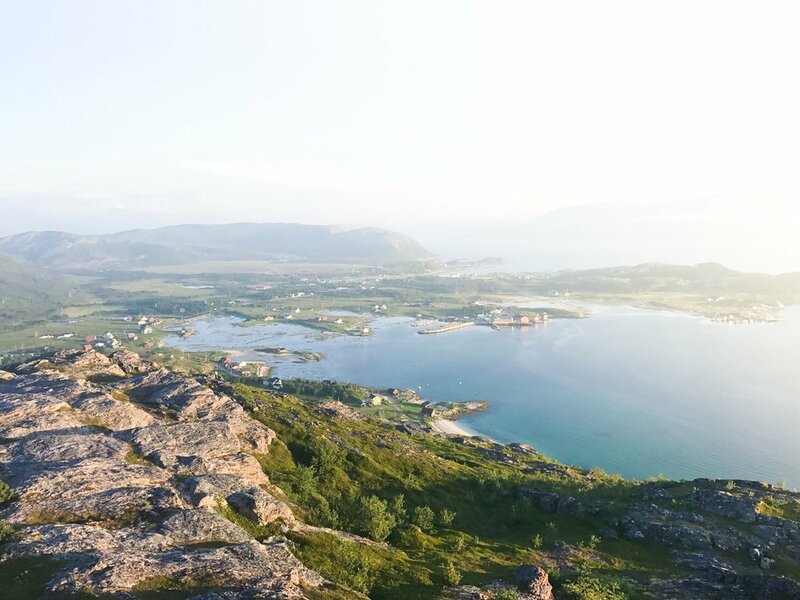 Just one hour from Tromsø, Sommarøy (summer island) is a magical place with never ending nooks to explore. It's calm, serene and the place you want to be on a sunny summer evening in the Arctic. A destination so tranquil, it sparks creativity with every breath and every step up the mountain. With never ending sunsets, infinite golden hours & bridges that lead straight to the sun - late night adventures are a breeze. Just make sure to bring a jacket, after all, we are still in the Arctic. Oh yes, don't forget to sign your name at the guest book on the top of the mountain to leave your mark.